New School Trustee Susan U. Halpern and New School faculty members and Race in the U.S. instructors Maya Wiley, senior vice president of social justice; Michelle Depass, dean of the Milano School; and Darrick Hamilton, associate professor of economics and urban policy at Milano and The New School for Social Research, with guest speaker and Woman's March co-chair Linda Sarsour. Linda Sarsour recalled the moment in the immediate aftermath of the 9/11 attacks when her life as a Muslim-American changed forever. On that day, Sarsour returned home from classes at Kingsborough Community College to Sunset Park, where her mother was watching her kids. Entering the house, Sarsour bumped into her mother, who was rushing to pick up Sarsour’s brother from school. She was stunned by what her mother was wearing — or more precisely what she wasn’t wearing. It was only after Sarsour saw the television reports of the planes crashing into the World Trade Center that she understood her mother’s comment: Fearful of being associated with the perpetrators of the 9/11 attacks, her mother felt it necessary to hide a publicly identifiable symbol of her identity. It was also on that day that Sarsour, angry and distraught by the injustice of the spurious association, decided to become an activist. Sarsour, a co-organizer of the 2017 Women’s March and former executive director of the Arab American Association of New York, recalled the experience in her discussion of the “racialization” of Muslims—the process by which a diverse Muslim religious culture has systematically been reduced to a narrow, stereotyped racial and ethnic profile for the purposes of discrimination and oppression. She stressed the importance of seeing our freedoms as “bound up” with the freedoms of others during this past Monday’s class meeting of Race in the U.S., a free public course offered at The New School. Convened by leading New School faculty members Maya Wiley, senior vice president of social justice; Michelle Depass, dean of the Milano School; and Darrick Hamilton, associate professor of economics and urban policy at Milano and The New School for Social Research, Race in the U.S. brings together prominent scholars, experts, thought leaders, and activists to examine issues including racial stratification, implicit bias, and the complex, intersectional relationships between race, gender, and class. Following up on last year’s successful Post-Election America series at The New School, the course carries forward the legacy of The New School’s landmark 1964 “Voices of Crisis: American Race Crisis” lecture series featuring Dr. Martin Luther King, Jr. And it advances the university’s storied tradition of critical engagement with urgent social issues — including race — in real time. The course is held every Monday through December 11 from 6:00–7:50 p.m. and airs on Livestream. Speaking before an audience at Starr Foundation Hall on the anniversary of the 9/11 attacks, Sarsour explored the ways race has been used to demonize the Muslim-American community. 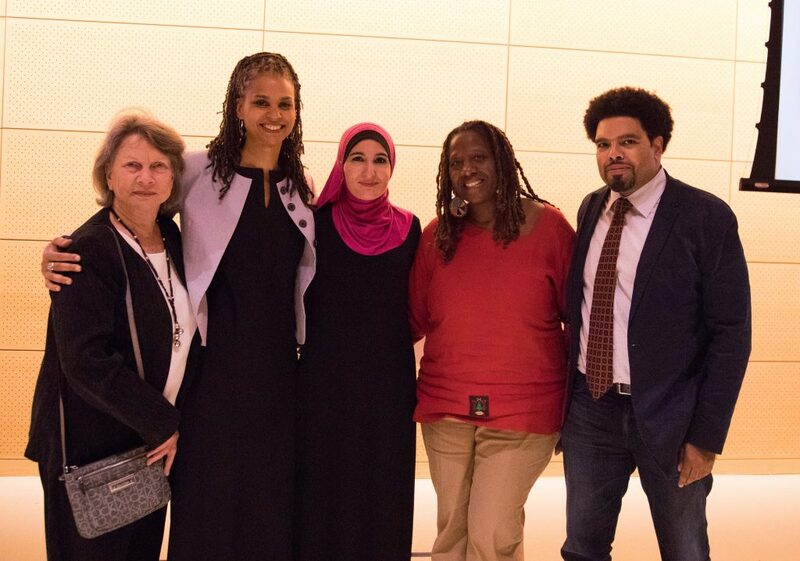 According to Sarsour, the events of 9/11 spurred anti-Muslim politicians and activists to set the machine of racialization in motion, targeting people of the Islamic faith—regardless of race—with discrimination and violence. The impact of racialization is staggering. Sarsour pointed to hate crimes against Muslims and vandalism of mosques following 9/11, including in Sarsour’s own neighborhood; protests against the creation of Islamic institutions (“in the land of religion freedom, there are people who decided it was a good idea to protest places of faith”); and illegal surveillance of mosques and Muslim-owned businesses by the New York City Police Department (“the NYPD had created what was effectively a Zagat survey of Halal restaurants”). “The only impact it had was to separate families, terrorize communities, and put people in chaos,” she said. Sarsour explained that NSEERS, the NYPD surveillance of mosques, and Trump’s anti-Muslim ban followed from “a long history of a nation that has targeted certain communities.” The treatment of Muslims, Sarsour said, was “reminiscent” of the internment of Japanese Americans during World War II. Sarsour’s words echoed those of the organizers of the Race in the U.S. course. Race in the U.S. is sponsored by the Provost’s Office of The New School and the 2017 Henry Cohen Lecture Series of the Milano School. For more information, including an updated list of weekly lecturers, class readings, and archived past lectures, visit The New School’s Medium page.